Midnightsky Fibers: Natural Dye Kit Giveaway! 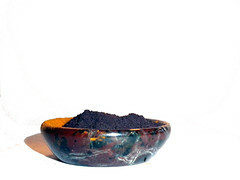 I will be giving away a natural dye kit to one of my lucky newsletter subscribers! If you are not already on the list, you can sign up on the newsletter page! I will be picking a winner at random from the list on Saturday! The winner will get one of my natural dye kits complete with mordant, dye, and instructions for each.